Malcolm X was assassinated fifty years ago, on February 21, 1965. Three years later, Martin Luther King, Jr. was also assassinated (April 4, 1968). These murders marked an escalation in the U.S. Government’s war against the Civil Rights Movement. In the 1960s, Roland Sheppard regularly attended Malcolm XIS meetings in Harlem. Between 1964 and 1965, he was in charge of security when Malcolm X spoke at the Militant Labor Forum in New York City. He is one of the few remaining people who personally witnessed the assassination of Malcolm X in the Audubon Ballroom. A life-long socialist, Sheppard was active in the Civil Rights Movement, the movement against the U.S. war in Vietnam, the Black Liberation Movement, the struggle for women’s liberation, for union rights, for workers democracy, and for socialism. He worked for 31 years as a union painter until his 1994 election as an official for Painters Local 4 in San Francisco. Sheppard is often invited to speak about his experiences. One time, when he was addressing an inner-city history class, he was astonished to find that the class textbook contained only two pages on the Civil Rights Movement. The students had a lot of questions after Sheppard’s presentation, and many stayed after school to continue the discussion. They were hungry for knowledge about their history. It has been half a century since Malcolm X and Martin Luther King, Jr., were assassinated. In the case of Malcolm X, several members of the Nation of Islam were convicted. In the case of Martin Luther King, Jr., one assassin, James Earl Ray, was convicted. Despite these convictions and ongoing efforts by government and police agencies, and various writers and pundits to put the assassinations to rest, many questions remain unanswered. In the 1970s, the public was made aware of the U.S. Government’s secret COINTELPRO program to employ informers, agents, and provocateurs to disrupt the Civil Rights Movement, the antiVietnam-War Movement, and radical and socialist organizations. One of the goals of this program was to ‘neutralize’ Black leaders like Malcolm X, Martin Luther King, Jr., and Elijah Muhammad in order to prevent the emergence, to use the government’s term, of a Black Messiah who would unite and lead Black Americans in their struggle for equality and freedom. 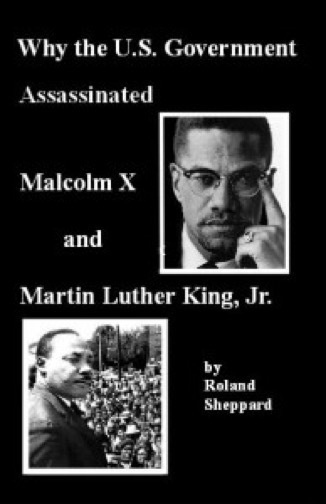 In other words, the United States Government had the same motive to assassinate Malcolm X and Martin Luther King, Jr. This pamphlet has its origin in a paper that was first published as the February, 2001 Monthly Feature for the Holt Labor Library and later included in the City College of New York’s (CCNY) Black Studies Program for The Third Symposium of Institution Building in Harlem: The Malcolm X Legacy: A Global Perspective (May 20,2005). I personally witnessed Malcolm X’s assassination. The afternoon of February 21, 1965, I went to the Audubon Ballroom to hear Malcolm X speak. When I arrived, I was surprised, to see no cops. Malcolm X’s meetings in Harlem were usually crawling with cops. When I entered the hall, I did not see any cops. I normally sat in the front-left side of the hall, along with the rest of the press, but that day, Gene Roberts told me that I had to sit in the front-right side of the hall. Roberts was later exposed as a police-agent member of the Black Panther Party. I glanced over to where I normally sat, and I saw a large Black man in a navy blue-gray trench coat. Then the meeting started. All was quiet as the crowd listened to Benjamin X introduce Malcolm X. As Malcolm X tried to calm things down, the two men – one later identified as Talmadge Hayer – started running down the aisle shouting and firing a pistol at Malcolm X. Then they ran out the exit doors by the stage, to the right of Malcolm X. Then I heard gunshots coming from everywhere, and I instinctively hit the floor. When I looked up, I saw Malcolm X standing on the stage and glaring down at one of his assassins. From the corner of my eye, I saw a bright flash, and I watched Malcolm X fall back about 10 feet. In that instant, Malcolm X died before my eyes. This vision of Malcolm X, being assassinated, has haunted me ever since. It was the saddest day of my life. As I left the hall, Malcolm’s bodyguards told me that they had caught two of the assassins, one who was shot – Talmadge Hayer – and one whom the police took away. A few weeks later, when I was questioned in the Harlem police station, I was shown photographs of people whom I recognized as members of the Nation of Islam and Malcolm X’s organization. I was also shown a photograph of the large Black man in the navy blue-gray trench coat. I did not know how to tell the cops that I did not recognize the photos of Malcolm’s friends and supporters. To buy some time, I told them that I had to go to the rest room. That was when I realized that the police and other government agencies had killed Malcolm X or were part of the assassination plot. I became very nervous thinking about what I was going to say to the cops when I got back and how I was going to get out of the police station alive. So I said, “I cannot recognize anyone. All Black people look the same.” The cops nodded in agreement, and I was allowed to leave. It was not enough to assassinate Malcolm X. His influence was so powerful that his enemies also had to assassinate him politically. In the 1990s, several books were published with the aim of camouflaging Malcolm X’s political evolution. Two examples are Malcolm: The Life of a Man Who Changed Black America, (1995), by Bruce Perry and Malcolm X: The Assassination (1995), by Michael Friedly. Perry and Friedly support the U.S. Government’s position that the Nation of Islam was solely responsible for the assassination and that the Government was not involved. To support their case, both authors deny Malcolm X’s growing radicalization and the political threat he represented which are documented in George Breitman’s books: The Last Year of Malcolm X: The Evolution of a Revolutionary (1970) and The Assassination of Malcolm X (1991). Despite the many media attacks and distortions, Malcolm X continues to live in our hearts – a martyred leader of his people and an uncompromising advocate of human rights and freedom. Many liberals and conservative Black Nationalists wrongly paint Malcolm X as a hater of White people. They refuse to acknowledge that he had become a political threat to the capitalist establishment. Denying this threat supports the lie that the U.S. Government played no part in his assassination. In fact, Malcolm X was becoming a huge threat. Malcolm X was the first mass leader in the United States to oppose the U.S. war against Vietnam and to connect the oppression of African-Americans with the struggles of oppressed peoples throughout the world. Had he lived, Malcolm X would likely have spoken at the first mass demonstration against the Vietnam War in 1965. His powerful oratory, combined with his standing among inner-city Blacks, would have pushed the Anti-War Movement in a more radical direction. His was the most moving speech at the rally and when he finished, all the workers – Black, White, and Puerto Rican – cheered wildly. This was the typical response to Malcolm X, whether he spoke in Harlem or at Oxford University in England. Malcolm X approached the struggle of African-Americans as a fight for full human rights, not just legal rights. He supported anticolonial revolutions in Africa, Vietnam, and Cuba – in direct opposition to the policies of the United States government. In December 1964, Malcolm X met with Che Guevara and the Cuban delegation to the United Nations with the aim of mutual support. Malcolm X was becoming a real threat to U.S. capitalism. That is why the United States Government assassinated him. Just before his assassination, Malcolm X knew that he had become a target. He told me and Clifton DeBerry, the presidential candidate of the Socialist Workers Party, that he hoped to live long enough to build a viable organization based on his current ideas, so that he would be more dangerous to the system dead than alive. The initial reports of the assassination stated that two people had been caught by the crowd. Later on, the press and the police reported that the crowd had caught only one person, Talmadge Hayer, who was shot in the leg and taken by police to the hospital across the street. No explanation has ever been given for that change in the story. On “The Smoking Gun” web site, a 1965 police affidavit of an eyewitness statement confirms that the crowd had caught two people. And in a news video released immediately after the assassination, the New York Police Department’s Chef Inspector Taylor confirmed that two suspects had been caught. Talmadge Hayer’s version of events corresponds with my own impressions at the scene. Hayer states that when he was shot and caught by the crowd he could see one of his accomplices running ahead of him. When I got outside the Ballroom, Malcolm X’s guards told me that two people had been caught by the crowd at the same time and that one was taken to the hospital by the police and the other taken into police custody. Hayer was taken to the hospital and then booked. What happened to the second man? Why wasn’t he brought to trial? I believe that the second man, the one running ahead of Hayer, was William Bradley, a police or government agent. And he was not the only one present. The first police report stated that five men were involved in the assassination; yet only three were accused and later convicted. Perry’s book supports the official police version of the assassination and ignores Hayer’s affidavit that the two other men convicted, Norman 3X Butler and Thomas 15X Johnson (both members of the Nation of Islam), were not at the meeting where Malcolm X was killed. When I was called before the Grand Jury on the assassination, Malcolm’s primary assistant, James Shabazz, confirmed that Butler and Johnson were well known and would not have been allowed to enter the Ballroom. Friedly’s book offers a more sophisticated cover-up. The book puts the blame solely on the Nation of Islam while also criticizing the police investigation. Both Friedly and Hayer state that five members of the Nation of Islam carried out the assassination, three people doing the shooting up front, and two people creating a diversion by setting off a smoke bomb at the back of the room. Hayer stated that the five assassins cased one of Malcolm X’s meetings at the Audubon Ballroom in the winter of 1964-65 and concluded that they would have a good chance of escape. This is unbelievable. There were normally 30 to 50 uniformed cops at Malcolm X’s meetings, stationed at all the exits inside and outside the building. Under these conditions, escape would not have been easy. At the meeting where Malcolm X was assassinated, the police were nowhere to be found, despite being warned that an assassination attempt was imminent, To succeed, the assassins would have had to know that the cops would be absent. Authors Perry and Friedly, and the police, all claim that Malcolm X requested no police protection that day. This is a lie. Malcolm X’s wife, Betty Shabazz, denies that any such request was made. 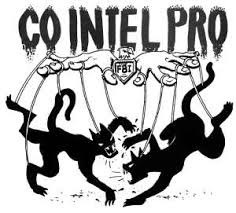 The FBI’s secret Counter Intelligence Program (COINTELPRO) was launched in August 1956 to “increase factionalism, cause disruption, and win defections” inside the Communist Party U.S.A. Soon after, the FBI was systematically bugging King’s home and his hotel rooms. “COINTELPRO-BLACK HATE,” which focused on King and the SCLC as well as the Student Nonviolent Coordinating Committee (SNCC) and its leader Stokely Carmichael. BLACK HATE established the Ghetto Informant Program that instructed 23 FBI offices to “disrupt, misdirect, discredit, or otherwise neutralize the activities of black nationalist hate-type organizations”. A particular target was the Poor People’s Campaign, a national effort organized by King and the SCLC to occupy Washington, D.C. In 1971, the existence of COINTELPRO was exposed when activists entered an FBI field office in Pennsylvania and stole secret files proving that the U.S. Government was conducting a massive spying campaign against dissident Americans. Eighty-five percent of COINTELPRO resources targeted the left: communist and socialist organizations; organizations and individuals associated with the Civil Rights Movement; Black Nationalist groups; the American Indian Movement; a broad range of “New Left” organizations; groups protesting the U.S. war against Vietnam; individual student demonstrators; the National Lawyers Guild; organizations and individuals associated with the women’s movement; dissident U.S. politicians, journalists, athletes, etc. FBI informers reported on every meeting, every word, and every action of members of the Black Panther Party, SNCC and other groups. FBI agents used informers to create dissension among activists and succeeded in weakening and destroying many organizations. And they are still doing it. Edward Snowden and Chelsea Manning remind us that nothing has changed except that in the 21st century, government agencies possess even more powerful tools to spy on and disrupt the lawful activities of dissidents. Malcolm X was considered such a threat that he was placed on the FBI’s COMSAB and DETCOM lists. COMSAB – Communist Sabotage, was a list of every American considered to be a treat to national security in the event of war. DETCOM – Detention of Communists was a list of every American whose arrest was to be given high priority in the event of a war or national emergency. They had good reason to fear Malcolm X.
Ahmed Ben Bella, the leader of the Algerian Revolution, had invited Malcolm X along with Che Guevara and other leaders of independence movements to a conference in Bandung beginning March 3, 1965. Malcolm X had also convinced Ethiopia and Liberia to include human rights violations against African-Americans in their petition on South-African human rights violations to the International Court of Justice at The Hague. The petition was to be presented on March 12, 1965. Had Malcolm X lived to attend the conference and the petition hearing, the stories would have made front-page headlines around the world and discredited the United States Government. To prevent this, Malcolm X had to be silenced. Malcolm X was assassinated ten days before the Bandung conference began. Several African government officials who had been working with Malcolm X were also assassinated, and the Ben Bella government was overthrown a few months later (June, 1965). The FBI was concerned about Malcolm X’s growing influence in America, and the CIA was concerned about his efforts to link the struggle of African-Americans with national liberation struggles in Africa and Latin America. After spending fifteen years researching more than 300,000 pages of declassified FBI and CIA documents, Washington Post staff writer Karl Evanzz summarized his findings in The Judas Factor (1992). Evanzz documents how the intelligence community, the CIA, the FBI, and the New York Police Bureau of Special Services and Investigation (BOSSI) used provocateurs and infiltrators to set the stage for the assassination of Malcolm X. The Judas Factor refers to the FBI’s attempts to neutralize Malcolm X, Martin Luther King, Jr., and Elijah Muhammad from the inside. Evanzz was able to prove that the FBI had a high-level informant in the Nation of Islam, which enabled the agency to sow discontent among rising leaders of the Nation and to disrupt the organization’s activities. From the day that Malcolm X split from the Nation of Islam, the FBI worked on a daily basis with BOSSI and the CIA to infiltrate his new organization, the Organization of Afro-American Unity (OAAU), and disrupt its activities. William Sullivan (director of COINTELPRO) was in charge of the infiltration of the Nation of Islam and the OAAU. Evanzz documents a coordinated effort among government spy agencies to widen the split between Malcolm X and Elijah Muhammad, leader of the Nation of Islam, to increase tensions between their two organizations, and to undermine their support among African-Americans. I am convinced that some of the agents, informants, and provocateurs that infiltrated the Nation of Islam and the OAAU were present at the Audubon Ballroom when Malcolm X was assassinated. Evanzz provides circumstantial evidence that John Ali, a former friend of Malcolm X who became a national secretary of the Nation of Islam, was likely an FBI agent or informer – the Judas Factor. Evanzz provides a series of statements, from Malcolm X to Lomax, indicating that Malcolm X blamed John Ali for his expulsion from the Nation of Islam. In Cover-Up: Unravelling the Assassination of Malcolm X (1992), Baba Zak Kondo indicts John Ali as an FBI agent and informant. According to Frank Donner, author of The Age of Surveillance: The Aims and Methods of the American Political Intelligence System (1980), most FBI informants are motivated by money. The Judas Factor shows that all the spy agencies in the United States were deeply involved, as infiltrators and agent provocateurs, to set the stage for Malcolm X’s assassination. John Ali was in a perfect position to deliver forged letters to Elijah Muhammad. It should also be noted that John Ali met with Talmadge Hayer on February 20, 1965, the evening before the assassination. See my essay, The Day The Music Died, for an update of the Malcolm X’s assassination and the identification ogf the assassin with the shotgun! Martin Luther King, Jr. was assassinated to subvert the Poor People’s Campaign. King was building a mass movement against poverty, and those who profit from poverty were determined to stop him. Since King’s assassination, the inconsistencies in the Government’s version of the crime have been well publicized. After COINTELPRO was exposed, the U.S. House of Representatives was pressured to launch an investigation into the Government’s role in the assassination. The Church committee released a report rubberstamping the official view that James Earl Ray was the lone assassin, and then it sealed the evidence for 50 years (until 2029). The only reason to keep these files secret is to protect the guilty. In the 1999 legal claim filed by the King family, “Coretta Scott King, et al. VS. Loyd Jowers, et al.,” the only named defendant, Loyd Jowers (the former owner of a Memphis bar and grill) was not their main concern. The primary defendants were the anonymous coconspirators who stood in the shadows behind Jowers. Since the trial, the King family and their attorney have lobbied ‘historians and elected officials to change the official record of the assassination, with little success. While many questions remain about the assassination of Martin Luther King, Jr., one thing is certain; the FBI was involved. A few days before King arrived in Memphis, the FBI leaked information to the local press that he was going to be staying at a White hotel. This forced King to stay at the less secure Lorraine Motel. Why would the U.S. Government want to assassinate the man who gave the famous “I Have a Dream” speech in 1963? The answer lies in the fact that King had developed his political perspective since then. He had begun to view the struggle for racial equality as an economic struggle and the capitalist system as the problem. In one of his last speeches, titled the “The Other America,” delivered at Stanford University in April 1967, King addressed the problem of inequality. Instead of his dream, he talked about the nightmare of the economic condition of Blacks. He talked about: “work-starved men searching for jobs that did not exist.” He described the Black population as living on a “lonely island of poverty surrounded by an ocean of material prosperity” and living in a “triple ghetto of race, poverty, and human misery.” He explained that after World War II, the unemployment rate was equal for Blacks and Whites, but by 1967 Black unemployment was double the rate for White workers, and Black workers made half the wages of White workers. ‘Two Americas’ was more difficult than eliminating legal segregation. He pointed out that the Northern liberals, who had given moral and financial support to end Jim Crow laws in the South, would not support the effort to end economic segregation. King opposed the war in Vietnam. He criticized the government for spending hundreds of millions of dollars for war and not for equality, and he pledged to mobilize people to fight for economic equality. “There is nothing but a lack of social vision to prevent us from paying an adequate wage to every American citizen whether he be a hospital worker, laundry worker, maid, or day laborer. “There is nothing to prevent us from paying adequate wages to schoolteachers, social workers and other servants of the public to insure that we have the best available personnel in these positions which are charged with the responsibility of guiding our future generations. “There is nothing except shortsightedness to prevent us from guaranteeing an annual minimum – and livable – income for every American family. I unarmed Black men prove that as long as there is no justice, there will be no peace. The capitalist class and its servants in government are a tiny elite who rule by dividing the much larger working class by race, religion, nationality, gender, etc. Unless we challenge those divisions, none of us can hope for a better life. The only lasting solution to the exploitation of workers and the oppression of African-Americans is for the multi-racial working class to unite and take control of society. That would be socialism. In such a society, there would be no need for any group of people to be oppressed. In such a society, Black workers would become the masters of the country that their ancestors built with their needs racism because it is profitable. And that is why they were assassinated. After Malcolm X and Martin Luther King, Jr. were assassinated, the more conservative leaders of the Civil Rights Movement abandoned independent mass struggle in favor of trying to elect Democrats and other politicians who promise, “Vote for me; and I will set you free.” The Government supported such activities by distributing ‘War on Poverty’ money to Black organizations. What W.E. B. DuBois called the “talented tenth” got comfortable government jobs. The decline in mass struggle combined with the co-optation of many Black leaders meant that the concerns of Black workers were abandoned. Today, the strategy of seeking improvements through elections has proved to be bankrupt, as the pensions, wages, benefits, and the standard of living of all workers continue to be attacked. However, Black workers form a disproportionate share of the unemployed, the poor, and the imprisoned. Social conditions have reverted to the pre-Civil Rights era for most Blacks. According to the Harvard Civil Rights Project, the nation’s schools have become re-segregated along Black, Latino, and economic lines. As the inner cities become gentrified, Black and poor people are being forced out of their homes. A disproportionate number of Black families lost their homes to foreclosure during the mortgage crisis. Despite these discouraging losses, a new Civil Rights Movement will rise. The protests in support of the abandoned victims of Hurricane Katrina, the explosion of the immigrant rights movement, and the mass protests that consistently follow the police shooting an unarmed Black men prove that as long as there is no justice, there will be no peace. The only lasting solution to the exploitation of workers and the oppression of African-Americans is for the multi-racial working class to unite and take control of society. That would be socialism. In such a society, there would be no need for any group of people to be oppressed. In such a society, Black workers would become the masters of the country that their ancestors built with their blood and sweat under slavery: the chattel slavery of the plantations and the wage slavery of the cities. The previous Civil Rights Movement offers valuable lessons for today: if we don’t let them divide us; if we keep our politics independent of the Republican and Democratic Parties and the Government; if we rely only upon our own power in the streets, in the schools, and at work; if we take up the struggles of Malcolm X, Martin Luther King, Jr. and the many other heroes of the movement – we can win. The coalition that King envisioned almost 50 years ago is needed today. The best tribute to Malcolm X and Martin Luther King, Jr. would be to learn from their struggles and carry their vision forward, to conclude what they so bravely began. Don’t Let Them Devide Us!